* The regularly planned meeting of the ACBA will be held on November 8, 2018. * The meeting will be held at the Ashe County Agricultural Center Office, located at 134 Government Center Drive in Jefferson, NC. * We have plenty of bottled water, and someone is bringing bottles of sweet tea. If you’d like to bring soft drinks, please consider either cans/small bottles and some sort of bucket/container of ice to set them in, unless they’re already cold. For large bottles (1- or 2-liter), please also bring ice and cups if possible; otherwise, let Helen know so we’ll have them. * Several members are waiting to hear what’s needed before making a commitment, but suggestions include mashed potatoes, deviled eggs, potato salad, green bean/stuffing casserole, and pimiento cheese. Burp. * We've always ended up with a table full of scrumptious goodies, so come hungry! If needed, there is a stove in the kitchen that can be used to re-heat items if necessary. * HIDDEN HAPPINESS BEE FARM/WINTERIZING ITEMS. H.S. Greene will be bringing the following items if anyone needs them: winter patties, mouse guards, oxalic acid, and vaporizers. If you have questions for H.S. and/or would like to ask about other items, don’t hesitate to call him at 336-957-0275. - As of this update, we have had two volunteers ask to fill the positions of Treasurer and Vice-President. We are thrilled but still need to replace several other positions as well: President, Secretary, and three board members. - The duties of the Vice-President and Secretary can be modified if desired to fit strengths and interests of the new officers. As Vice-President, some of what I’ve done might be better suited for the Secretary, or maybe some tasks can be divvied up among the board members if it’s determined to be beneficial for any reason. It’s not hard, and everyone on the board has been agreeable to do whatever! - Doug Ehrhardt, outgoing Secretary, takes notes during the meetings and tweaks the web site; he has stressed that he will remain a resource for his replacement for the web site work, which he says is EASY. He’ll also retain the ability to work on it himself if necessary. - It’s an unfortunate coincidence that the terms of all three board members (1-, 2-, and 3-year positions) expire this year. According to the by-laws, the primary duty of these three members is to go over the books at the end of the year. That could be done over a cup of coffee :) The board members can likely be given some other tasks as well to balance out the board members’ responsibilities, but that can be determined by the new board. - Because most of us also juggle myriad other responsibilities, we’ve been able to hold the number of actual board meetings to a minimum - one (usually in February) before the meetings resume in March to determine the direction of the year, and maybe one more during the year… or not. Most board business has been handled sufficiently via email; for anyone interested in participating who does NOT have email, phone calls will suffice just fine. This is a flexible group! Don’t be concerned that your work schedule and/or other commitments might interfere; we’ve only had all members of the board in attendance for just a handful of board and/or general meetings over the past few years. - In looking at the Watauga bee group’s web site to confirm a new meeting night this month due to the election, I happened to see this statement and decided to share it here because it also fits our group: Remember this is YOUR club and your participation is needed and appreciated. Think how you can be involved. It is YOUR club. If you don’t help with running it, then who will? Don’t just sit and watch; try to make a difference. If only a few people do all the work, they will eventually get tired; if you want the club to continue and to thrive, please consider giving just a little time and effort to the club to keep it viable! * Thanks in advance for making sure ACBA continues to assist local beekeepers and our bees however possible by helping on the board! IMPORTANT: We must have a board in place to submit to NCSBA by sometime in December. Without a board, there will be no ACBA. Parties in Watauga interested in beekeeping, the Allegheny bee group's evening meetings have been changed to the second Tuesday of the month, beginning in March. - H.S. Greene is now taking applications for a beginner beekeeping course that will be held in 2019. The six week course will Include beekeeping history, honey bee biology, pests and diseases, colony management, colony observation, hands on wooden ware assembly, beekeeping choices for optimum equipment acquisition and use. Apiary visits for students at HHBF per schedule with signed waver of liability. 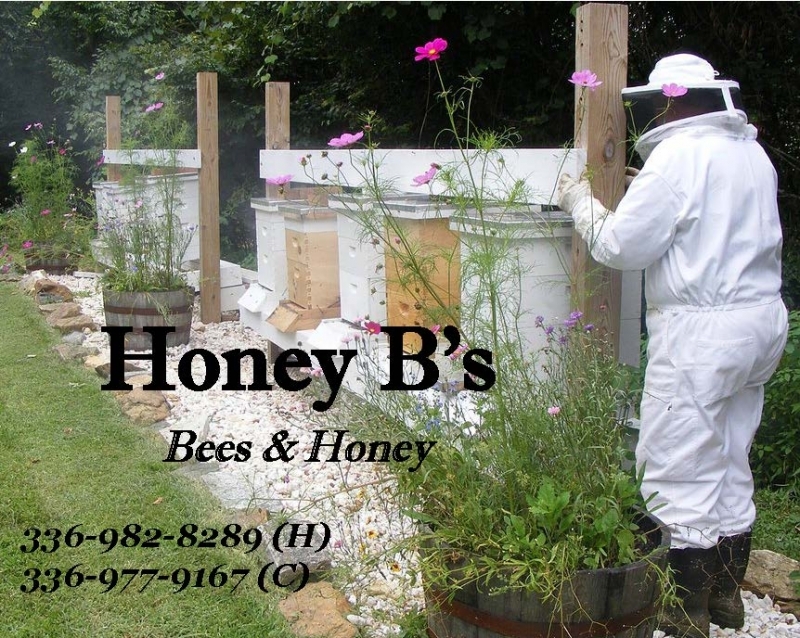 - NCSBA Master Beekeeper Program Certified Level written beekeeper exam will be offered to qualified students on the last class day. The Certified Level Practical exam will be offered in July, 2019. An Intermediate Beekeeping Class started on September 10th. Classes are held at Wilkes Community College/Ashe. Classes from 6-9 PM each Monday. For more information on ways to register, call Becky Greer - 336-903-3117 or email - rcgreer213@wilkescc.edu. * There will be a Beginning Beekeeping class at Wilkes Community College/Ashe campus beginning this Monday (3-19) from 6-9 PM. * Shelley Felder (The Honey Hole) is teaching the class every Monday for 6 weeks. * Need more info?? Call 336-846-3900.